I was an extremely shy, quiet, in reserve child. Even up until college my shyness followed me around and it still does today. But one day in college, just 1 time I walked up to somebody and asked if I could share a table at what appeared to be the only open seat in the cafeteria. It was out of character for me, but I struck up a conversation and made a new friend. When I became a parent I didn’t want my child(ren) to be anxious with the same level of shyness that I carried with me in some adulthood. Unfortunately, we know that there is not a manual to figure out exactly how to raise. Everyone does have an opinion though. We hope to have good instincts, learn something from what our parents did, and take some advice from our friends that may have entered their parenthood journey first. Shyness and who is safe to talk too is one of those situations that presents that task of differentiating the very fine line between friendliness and stranger danger. Trying to figure that line out is not very easy. On his first day of preschool, he cried terribly. It was just like me on my first day of Kindergarten. He also continued to cry for the first 2.5 weeks (2 classes per week). By the sixth day of school he was still timid but willingly took the teacher’s hand to get out of the car and go to class. He became best friends and a shadow to the teacher’s aide and talked little with the kids in his class. Throughout the year he would start to finally make friends. What does this all have to do with Disney? When year two of preschool started there was only one day of a few tears. He was still rather reserved. 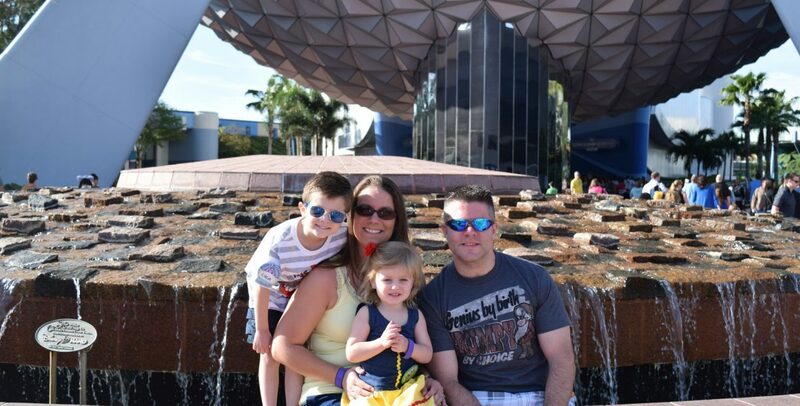 It was towards the end of this school year that we took our first trip to Walt Disney World. Magic really happens here. Cast members whether in acting as a character, greeting guests at the gate, working on a ride or a serving at a restaurant really know to interact with people, but children in particular. On our first day, Peanut was selected a couple of times to be the “timekeeper” in the lines. The Cast Members briefly chatted with him and us and explained how important his job was. He got a little excited about it. It was on day four of our trip when he had a full-length conversation with Mulan explaining his lightsaber to her. I looked at Grumpy, after picking my jaw off the ground, and said: “Listen to him talking to her.” It was an unbelievably sweet moment but it was a proud moment. He shed some of his reservations and just let the conversation flow. A few minutes later he was in serious conversation with Pocahontas. After this point in the trip he also ordered his food, answered questions from the bus driver, and TALKED TO ANOTHER KID ON THE BUS BACK TO OUR RESORT. He didn’t start the conversation but he didn’t hide from it. This was HUGE! I may have had tears in my eyes as I watched the conversation take place from a few feet away. When we got off the bus he had learned that the other kid was staying in the Nemo section of the resort and they had decided they wanted to meet at the pool later in the day. He did fail to get the kid’s name or ask the parents if they were heading to the pool, but he made a friend…. at least for the twenty-minute ride. It was a beautiful moment to watch my son grow up a little bit right in front of my eyes. We returned home and he started requesting his drinks if we were out to eat or asking the cashier at Target if he could have a sticker, for both his sister and himself. It wasn’t constant and there was often hesitation. There was and still frequently is a glance to us for a nod of approval. These were all steps in the right direction. By the end of our second trip he asked if he and Diva could go sit with a boy at the airport and share their toys. They chatted with boy and played together for almost a half hour while we all waited for our flights. The other kid is sitting on the floor behind the pole. Yeah, I know it’s not all because of Disney. Grumpy and I do deserve credit too. We worked hard to teach him about safe “strangers” and to encourage appropriate engagement with other individuals. His preschool teacher and the aide worked with him on his social skills with other children. But Disney though helped it all click for him. I can say with certainty that we could not have taken another weeklong domestic or international vacation and had the same outcome. Meeting his favorite characters, even if he told me there was a person inside the Mickey costume, allowed him the freedom to have a little fun and express himself to and with them. He wasn’t hiding behind us anymore. He was standing in front of us and having a conversation. He truly understood that it was a safe environment. We regularly talk about how much he changed in such a wonderful way on that first trip. I think it helped tremendously to prepare him for much more social interaction as he went away to kindergarten on a bus with other kids and into a new school with new teachers, classroom aides, parent helpers, and lunchroom aides. He was no longer afraid to talk with other kids. But we are still working on making sure he gets their name, especially when he plans a play date. Thanks for sharing your story. As I read I had tears streaming down my face they were tears of pride and joy. I’ve watched you evolve and am watching Peanut evolve it melts my heart. Very well put Nikki. Being a mom I can relate to all of this. I too had a a shy little boy that did over come his shyness and now is a grown man and you wouldn’t even think that he was shy at one time. Has for Luca there has been a change, and a it has been a delight watching and being part of the process.